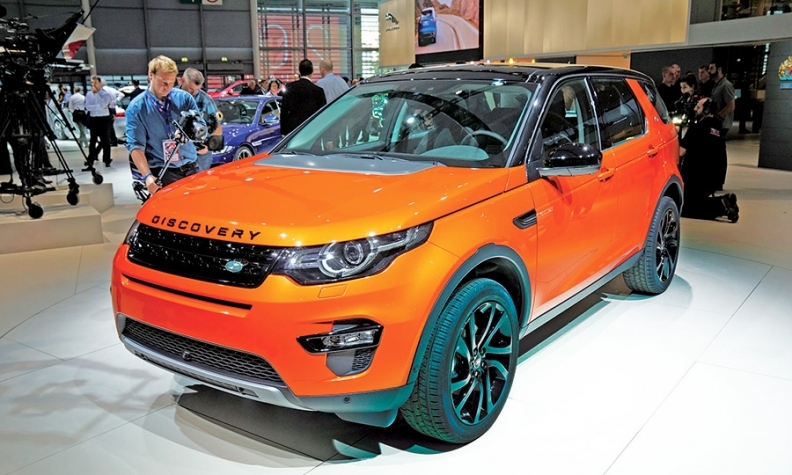 The Land Rover Discovery Sport, pictured, and Jaguar XE are among the vehicles due in the coming years. PARIS -- Jaguar Land Rover executives are confident that new products in new segments will drive their global sales sharply higher in three years. But they're cagey about just how much higher, eschewing hard numbers for clues that point to more than 700,000 vehicles. Andy Goss, global group sales operations director, said he doesn't expect Jaguar Land Rover's worldwide sales in 2017 to double from the 425,006 vehicles sold last year. So that's fewer than 850,012 vehicles. But Goss said volume will rise to about half that of Jaguar Land Rover's smallest German luxury rival. That's Mercedes-Benz, which sold 1.5 million vehicles last year. Half of that is 750,000. But Goss did not predict how many vehicles Mercedes would sell in 2017, keeping Jaguar Land Rover's expectations for its own sales a mystery. Goss said much of Jaguar Land Rover's growth will come from Land Rover, which is developing two vehicle families -- midrange luxury Discovery and entry-luxury Defender -- to join the upper-end Range Rover family. The result, he said, will be three "legs," or vehicle families, for Land Rover. The Discovery range, with at least three vehicles, will be sporty. The compact seven-seat Discovery Sport was unveiled last month at the Paris auto show and the larger Discovery concept debuted in April at the New York auto show, he said. "Three years from now, you will see a fully mature Discovery leg," Goss said. The Defender lineup will be the utilitarian range, he said. The Defender hasn't been sold in the United States since 1974. The revamped Defender family will be the last to debut and probably won't go on sale before 2017, Goss said. "Internally, it is the next significant area of investment, and we are already well down the track to create a range of products where we can dial up utility," he said. Jaguar is beginning to grow with the launch of the F-Type coupe and convertible and the compact XE sedan that goes on sale next year in Europe and in 2016 in the U.S.
Jaguar is beginning to grow with the launch of the F-Type coupe and convertible and the compact XE sedan, pictured, that goes on sale next year in Europe and in 2016 in the U.S.
Jaguar has shown a concept crossover but hasn't confirmed it will be built. Still, Goss said "that type of vehicle" will join the lineup. Jaguar sales are hampered in the United States because the brand is trying to compete with a limited lineup against rivals with full portfolios, said Joe Eberhardt, CEO of Jaguar Land Rover North America. The XK convertible and coupe go out of production at year end, leaving Jaguar with the sporty XF coupe and convertible, the midsize XF and full-size XJ sedans. 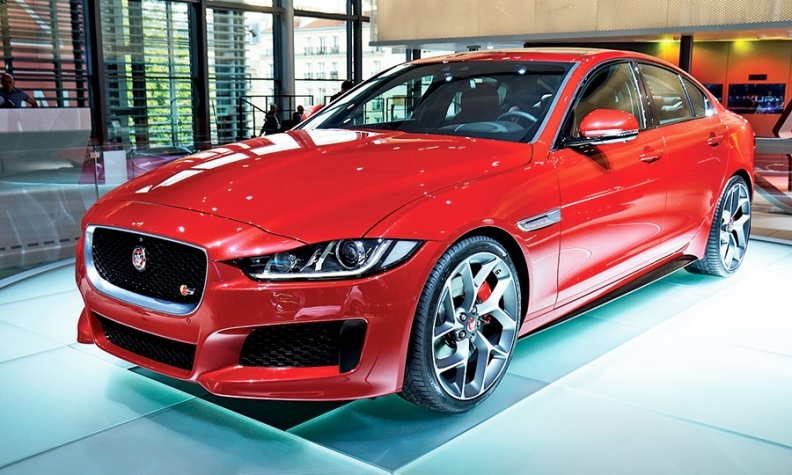 Last year, Jaguar's U.S. sales were 16,952 cars and Land Rover's were 50,010 vehicles. Through September, Jaguar's U.S. sales fell 5 percent to 11,830 cars and Land Rover's rose 9 percent to 38,424 vehicles. U.S. sales have been constrained by a product shortage, particularly at Land Rover with an 11-day supply of the Range Rover Sport and a 12-day supply of the Range Rover and Land Rover LR4, Eberhardt said. 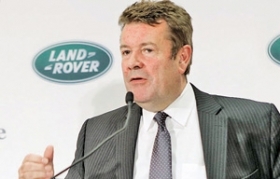 The shortages will ease toward year end because Land Rover is adding production capacity in the United Kingdom, Goss said. In addition, Land Rover began building vehicles this year in China, where it has a 130,000-vehicle annual capacity, he said. In 18 months, production will begin in Brazil in a plant with a 24,000-vehicle annual capacity, he said. A new engine plant opened in the United Kingdom at the end of October. That will end another bottleneck, Goss said, because there has been a shortage of gasoline engines.